March for Our Lives Utah activist Noah Blumenthal has been lobbying state lawmakers on gun reforms measures in the year since the Parkland, Fla. school shooting. In the year since a gunman opened fire at Marjory Stoneman Douglas High School in Parkland, Fla., killing 17 people, there have been marches, town halls and a resurgence of student activism. But, as far as 17-year-old Noah Blumenthal can see, not a lot of substantive policy change. “What I’ve noticed recently is that that our elected officials are more open to meeting with us, but not necessarily more responsive,” Blumenthal said. Blumenthal, a senior at Rowland Hall High School, is outreach director for the Utah chapter of March For Our Lives, the nationwide student-led movement that was borne out of the Parkland massacre. While juggling a full course load, Blumenthal and other members of the group have been lobbying state legislators for the last year on gun reforms. 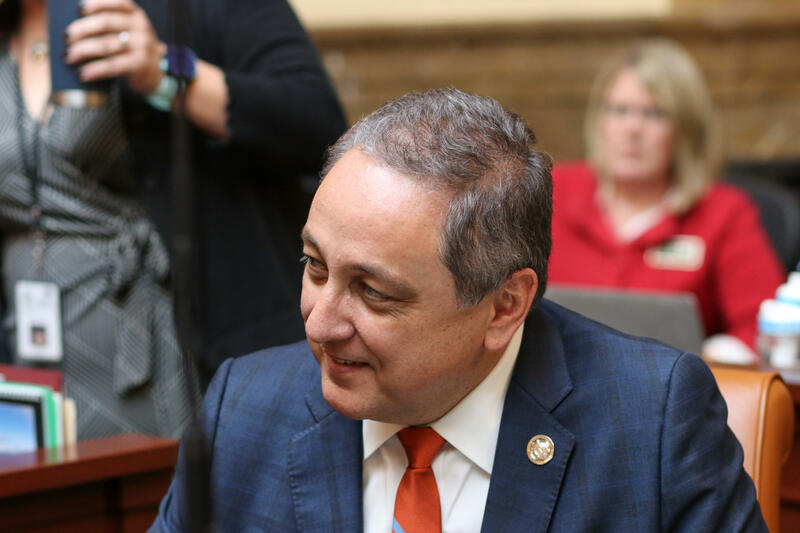 Despite a handful of proposals from Democrats and some moderate Republicans, the Utah Legislature, already in its third week, has only heard a few bills pertaining to firearm regulations. Several more languish in the House Rules Committee. The most high-profile one is from Rep. Stephen Handy, R-Layton, that would allow law enforcement to seek a court order to confiscate weapons from a person who poses an imminent threat to the public or to himself. The bill, H.B. 209, was first proposed last year immediately after the Parkland shooting. It had initial backing from former House Speaker Greg Hughes, but was quickly killed in committee. Handy, speaking to a press conference of the Domestic Violence Coalition on Tuesday, acknowledged that the legislation, often referred to as a “red-flag” law, still faces an uphill climb. Rep. Cory Maloy, a pro-gun rights lawmaker from Lehi, is one of the bill’s most outspoken critics. “We are looking at turning law-abiding citizens into criminals — that’s the biggest issue I have,” said Maloy of Handy’s bill. Maloy introduced what he described as an “alternative” that would reinforce an existing law allowing a co-habitant, such a person’s spouse, to voluntarily turn over a weapon, a move some gun control advocates see as undercutting H.B. 209. But Handy’s legislation isn’t the only gun reform bill that has yet to get a hearing. A safe storage proposal from Rep. Elizabeth Weight, D-Salt Lake, and a bill by Rep. Andrew Stoddard, D-Midvale, that would stiffen liability for a firearm owner whose gun is used in a crime are still waiting in the queue. Lehi Republican Rep. Cory Maloy is among the Legislature's most ardent gun rights lawmakers and is advancing three proposals this year. In fact, most of the gun bills that have been heard so far come from Maloy, including a resolution with 30 co-sponsors stating that Utah should simply enforce the gun laws already on its books. Maloy expressed mixed feelings about whether the gun debate had gotten better since Parkland. High school senior Blumenthal sees similar inaction on the federal level. According to Blumenthal, U.S. Congressman John Curtis, a Republican who represents Utah’s 3rd Congressional District, met with the group last summer to talk about gun violence, but was noncommittal on specific proposals. “Every time we stressed, ‘Will you introduce a bill or sponsor this bill for universal background checks?’ he basically said, ‘I don’t know, maybe, but I’ll meet with you as often as you’d like,’” said Blumenthal. A spokesperson from Curtis’ office, Ally Riding, did not dispute Blumenthal’s account but pointed to legislation co-authored by Curtis last year that would, among other measures, allow states to enact extreme risk protective orders such as Handy’s. “Rep. Curtis is a strong defender of the Second Amendment, but he also believes more should be done ‘to keep firearms out of the hands of violent individuals and the mentally ill,’” Riding said in an email. Blumenthal says reframing the contentious debate over guns to address Utah's high rate of youth suicides and domestic violence has resulted in the most progress, especially with reticent lawmakers. As student activists pause to commemorate the Parkland anniversary, Blumenthal believes the March for Our Lives movement still has a lot of forward momentum, even if it is a little slow-going at times. “We’re focused on creating change beyond just this one shooting — that we are about young people being involved in government to better the lives of everyone,” Blumenthal said. Utah lawmakers are mulling legislation that would require firearms to be put in safety mode and locked away while they’re not being used. And while details are still being worked out, the idea is already getting pushback from the National Rifle Association (NRA).